Sometimes you go through a spendy period. Last month was one of those times, when I ended up surprise-spending several thousand dollars (ouch, that’s a lot to me) due to various developments — a sudden need for expensive vaccinations, a computer that died, and other randomness. It can be discouraging to consider all the money we burn, all the things we lose that we were trying to keep. After my initial stressing about how hard I’d worked to be pragmatic about finances, and the amount of time I’d put in for this money that was just zapped in a few short strokes, I actually started to feel relaxed. Like when something goes to hell, but that’s precisely when you can ease up because it’s already on its way. There’s a farmer whose fields run nearly to the end of my house’s porch. Or, more likely the field was not planted close to the house but the house was planted close to the field. 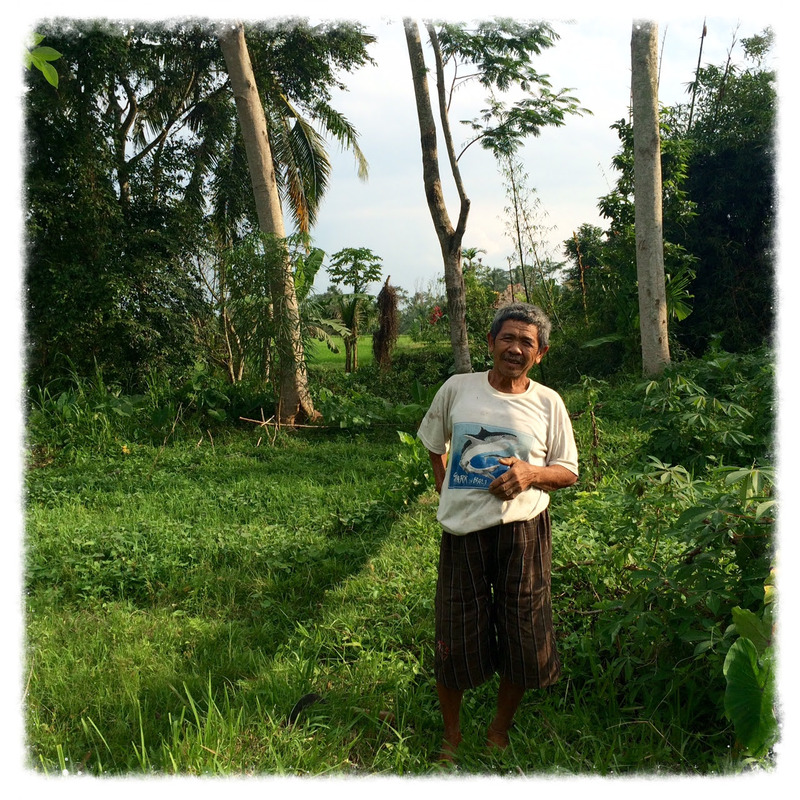 Wayan comes by pretty much daily, if not to work on his fields, then to build a fence or to cut tall grasses that he stuffs into a big white sack. I eat dinner outside while Wayan is making use of the last daylight hours to do his chores. He’s about my height (i.e., SHORT) and has a gnarled right arm. One day as I was about to sit and eat my colorful dinner alongside his chores, I decided to make him a small present. I studied Google Translate for a few minutes, and then waved him over. Camilan kecil, untuk Anda. A small snack, for you. He smiled. He accepted the bundle of fruits with a wave, motioned for me to set them down by the altar at one corner of his paddy, and went back to his planting. We’ve often heard that it’s human to give. It struck me then that it’s just as natural — and noble and necessary — to receive. 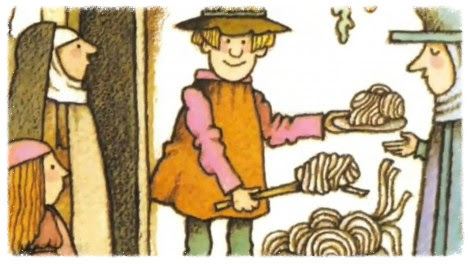 Do you remember the story of Strega Nona and the neverending pot of spaghetti? First of all, never-ending spaghetti. How cool is that. Never mind what you think of spaghetti now. As a kid, this was a dream come true. 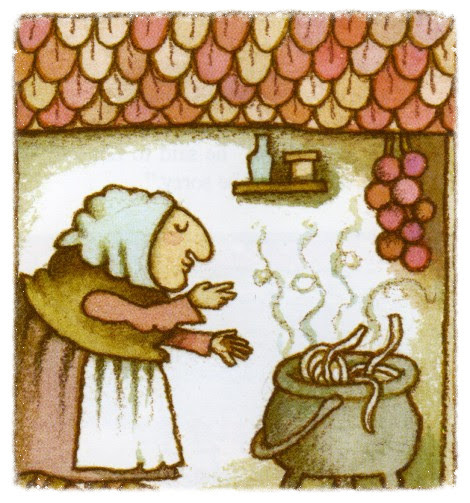 Second, I didn’t care about the magic pot, or the story’s moral to not to disobey witchy granny types and get all greedy for spaghetti and special powers. I was awed by the story of never-ending abundance, of having enough from one’s own pot to feed a whole village. What if this were our default belief about everything? 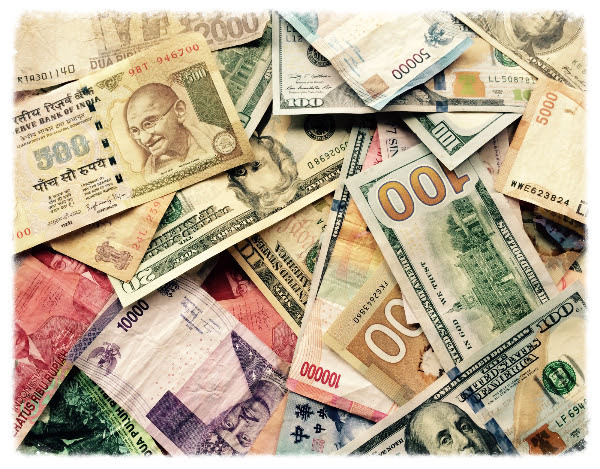 That no matter how much we gave away, we would always have more — more to feed ourselves and more to give — that we had in our possession a very special, regenerating pot of never-ending abundance? Once when I was ten years old, my family went back to Chongqing to spend Chinese New Year with our relatives. It’s tradition for the productive generation — working adults — to give cash to the kids and old folks. But I never saw a single dollar of that year’s haul — not in the form of any toys, outfits, or red envelope-funded savings accounts. I found out the answer only recently. My parents told me “we’ll hold onto” the Spring Festival money, in reality setting it aside to pay forward to my cousins and others in our extended family. My red envelope money was never mine. It was simply a symbol of value and abundance that momentarily passed through my hands on its way to the next person who would hold onto it for a little while. This is all that money is, this is all that anything is. To me, Spring Festival — Chinese New Year — is a holiday of giving, like the Native American potluck, like “stone soup,” and like so many others, that celebrates what you have now, and ushers in even more. “Gong Xi Fa Cai” (恭喜发财) is a wish of prosperity. May your endeavors be prosperous, may you be graced by wealth and abundance in whatever you do, and may you always have enough to give away. PS — No email is complete without a call-to-action. Today, on this random and potential-filled weekday, why not GIVE something away to someone you really know in real life, let it go and don’t ask for anything back. Ideas: give away a little of your time, expertise, attention, love. Share a good idea, share your meal or your umbrella, share the credit. Give a ride, a seat, some space, or a hand. And let me know how it goes!